As any mixer can attest to, chocolate is hard to get right. Especially when you're going for an Oreo tastes and texture. Oreo's have a distinct chocolate taste unlike a chocolate bar. It's more of a dry, dark, gritty taste with a luscious cream smashed between. I went through 7 versions to try to get the Oreo right. My first choice of cookie was FA Cookie, and that was exactly the right cookie to start with. The chocolate was a different matter. I started with TPA Double Chocolate(clear) at 2%. And while the chocolate was there, it was too "in-your-face" and slightly bitter so I brought it down to 1%. That seemed pretty close. I also tried combining INW Milk Chocolate, and while it's a good chocolate to work with, it tended to make the recipe into more of a chocolate shake, and that was not what I was going for. I ended up settling on TPA Double Chocolate (clear) at .75% and it seems spot on, especially when combined with FA Cookie at 2%. Now the cream. This was probably the easiest of the layers. TPA Bavarian Cream is one of the best flavors in any mixers arsenal. It's creamy, rich, and has a depth that some creams fall short on. When paired with CAP Sweet Cream at .5%, it lends itself well to that sweet and creamy center of an Oreo. Last, but not least, the TPA Vanilla Bean Ice Cream. My original version didn't have this flavor and while it was a good cookies and cream, it was more like a double cream Oreo cookie. It seemed to need a little extra push into a Real Cookies and Cream and TPA Vanilla Bean Ice Cream at 1% did the trick. I added CAP Super Sweet at .25% to sweeten things up a bit, and voilà, The Real Cookies and Cream! You done good boy!!! I dont like chocolate vapes normally, but this one is perfect, dry crumbly texture just like an oreo, and ZERO band-aid off notes. This is my new ADV, thank you. Im going to try this with JF bavarian cream and see if it makes it even better. 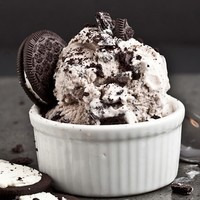 Clearly this recipe benefitted from the 7 revision cycles, as you nailed the Oreo Cookies & Cream Ice Cream flavor perfectly. A very well balanced juice that tastes great and tastes exactly like its name, thanks folkart! Very nice and subtle flavoring. I'm not overly familiar with Oreos but this to me tastes like cookies and cream ice cream flavor. Add some Koolada and it would be. To me, you NAILED a cookies and cream vape. Low %'s and very good tasting. I get a good cookie taste/feel and a great creaminess. It's almost too artifical for me to vape. It reminds me of some of the artifical cookies and cream protein shakes, or drink mixes I have tried. Its good, but it's lacking something. The chocolate in this plays very nice, especially with bavarian cream. I love DCC and BC together, tastes amazing. This is actually the best cookie and cream I’ve ever had. Been vaping this for the past few days and I've got to say I believe you've nailed the profile. The cream is the star of the show with the chocolate cookie being the back note of the recipe. I get a nice, lightly sweet cream on the inhale followed by the hint of the dry and gritty Oreo cookie on the exhale. Not to sweet and perfectly balanced. This can be a little harsh off the SnV, but after the recommended 3-day steep time this is a very enjoyable recipe that isn't too heavy or taxing on the pallet. Kudos to you for making this recipe, will definitely mix this one again.